This may not be authentic it but is my version and allergy friendly. Well at least to my allergies. I adapted the basic cake recipe from Cooking Light. I usually make the cake a day or 2 in advance and allow the milk to soak in overnight. About 2 hours before serving I add the frosting and toppings. Mix the milks together in a bowl or jar. I use a mason jar and shake the mixture well. Coat 1 9×10 cake pan with cooking spray. Spoon sifted flour into dry measuring cups. Combine flour, baking powder, salt, and baking soda with a whisk. In another bowl combine milk and yogurt. Alternately add flour mixture and milk mixture to butter/sugar mix. Pour cake batter into prepared pans. Bake at 350° for 25 -30 minutes until a wooden pick inserted in center comes out clean. Cool completely. Poke holes in cake and pour remaining milk mixture over cake. Allow to soak in for at least 2 hrs. I usually let it soak over night. 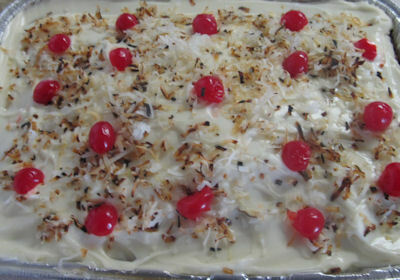 Top with coconut and cherries.